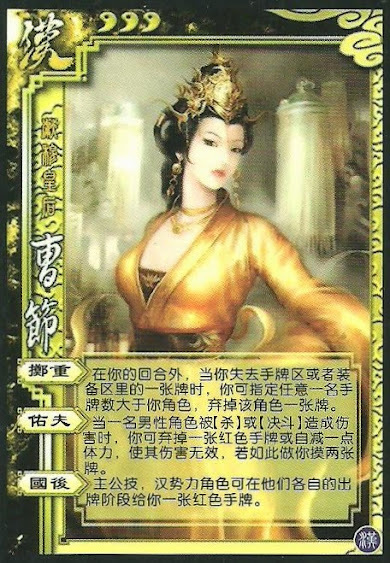 Cao Jie can target a player with more hand cards and discard a card from her hand or equipment. The target then must discard one as well. When a male is damaged from an attack or duel, Cao Jie can discard a red hand card or lose one health. If she does this the damage to the male does not happen. If she discards, Cao Jie draws two. Other members of Han can give Cao Jie a red card during their turn. When Cao Jie uses "Shifting Weight", she discard hand cards or equipped cards. The target can also discard either, even a different one than she did for each instance. "Blessed Husband" is optional for Cao Jie. She does not have to use it when it applies. No matter which option Cao Jie uses for "Blessed Husband", the damage to the male is prevented. "Backing the Nation" works the same way as Zhang Jiao's "Amber Sky", but with different cards.